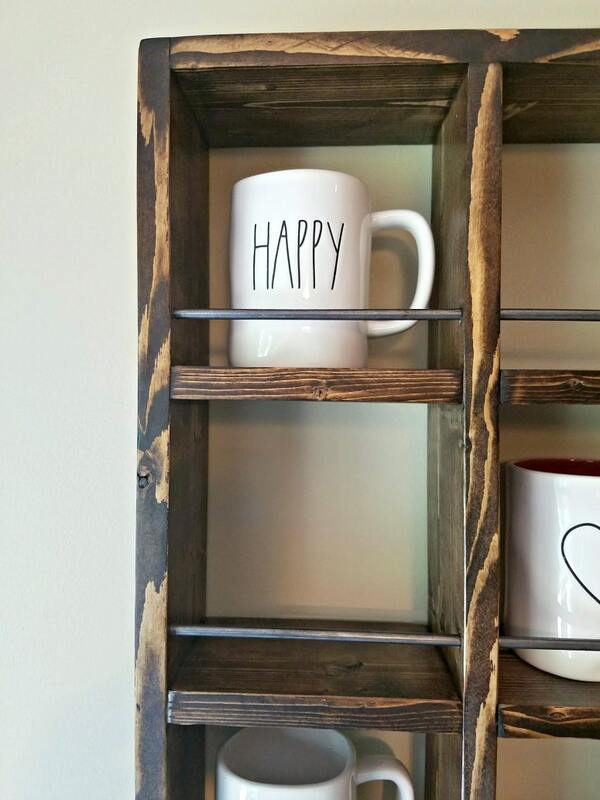 How to Build a Rae Dunn Mug Holder for Cheap! Hi there! If you don’t already know me, I’m Brittany! 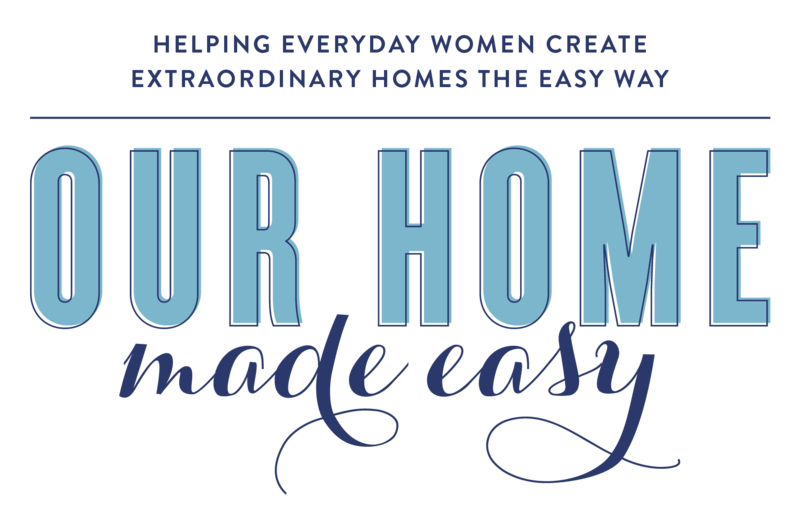 Over here at Our Home Made Easy I am passionate about sharing time saving projects, simple recipes, and easy home decor for any busy mom. One of the most popular Instagram-worthy collections lately is all things Rae Dunn. There are so many #neverdunn hashtags that make me giggle. 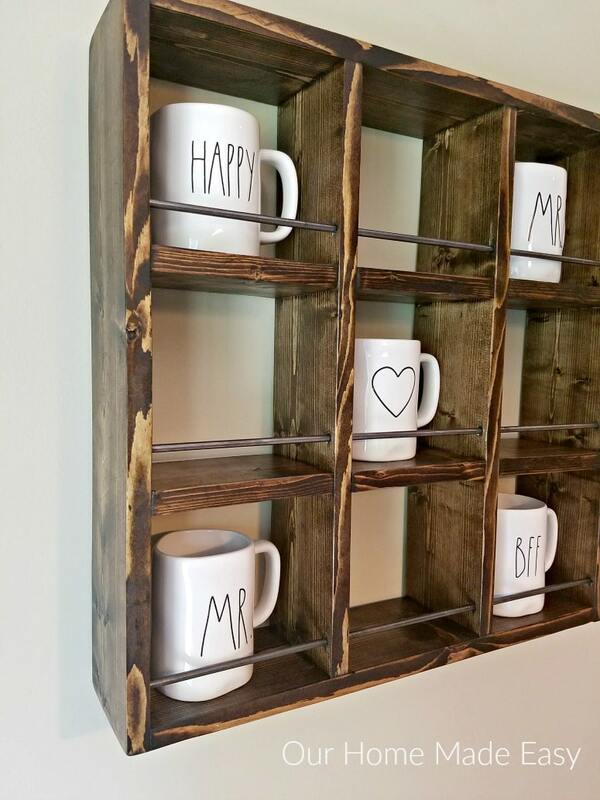 So it was no surprise when my sister, who visits her local Home Goods more than she cares to admit, asked Jordan if he’d consider building her a coffee mug holder to store her collection (and free up counter space for more 😉 ). 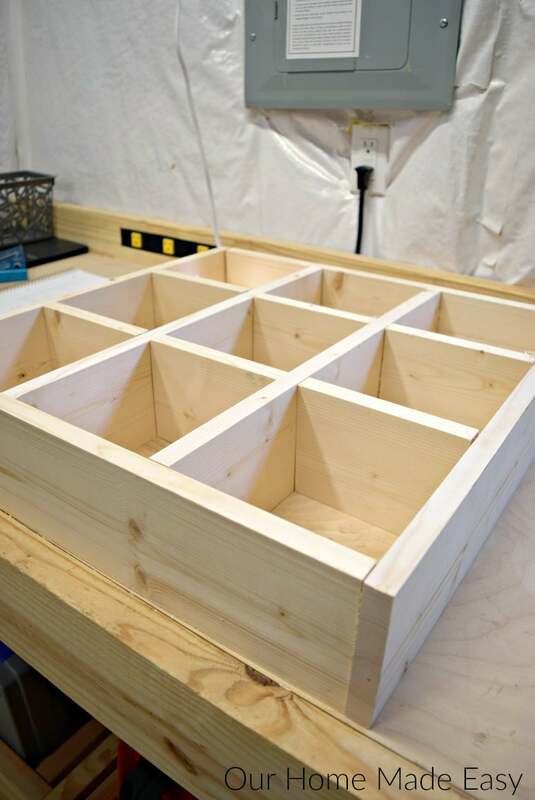 Jordan built this holder in an afternoon and I’m even considering starting a collection…..
You’ll see that the Kreg Jig is central to assembling this holder. If you don’t have a Kreg Jig, I cannot recommend it enough! 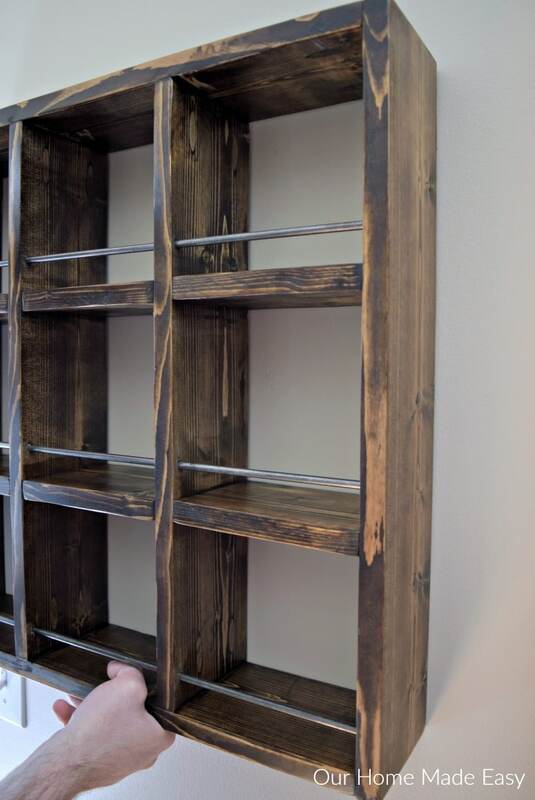 It’s perfect for weekend DIY-ers who want to create their woodworking projects, but don’t need to spend a lot of money. 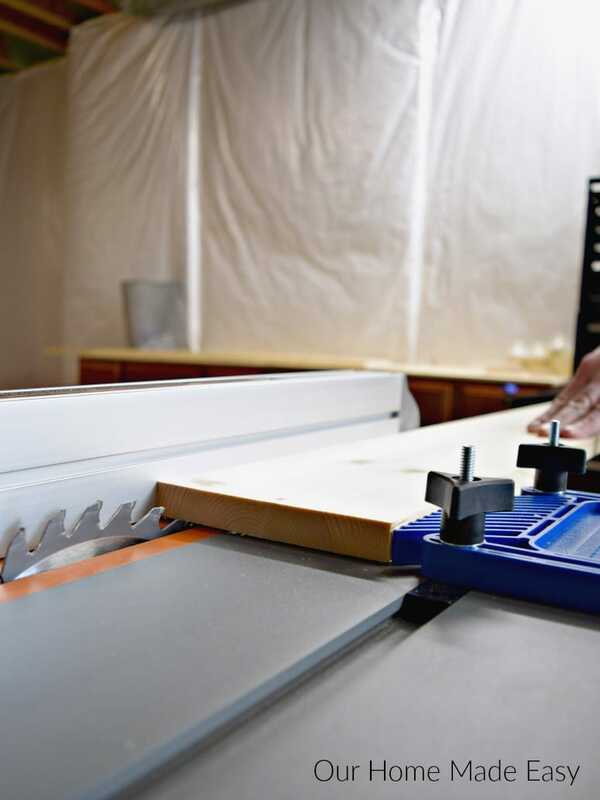 Then, you’ll want to mark your drill holes 1″ above each level, 3/8″ from the edge of the front of the board. Drill your rod holes using a 5/16″ bit. 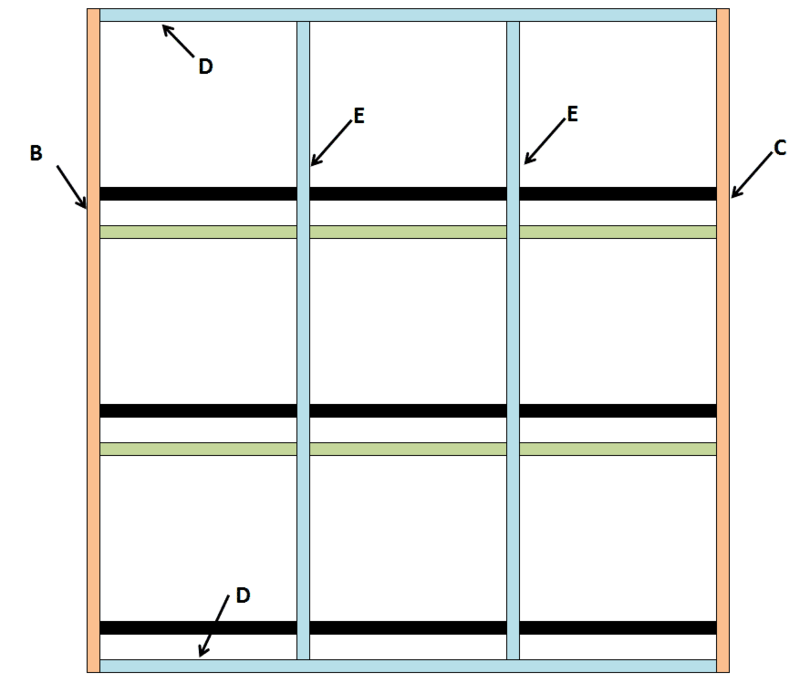 You will drill through the entire board for the inner 2 boards. For the outer boards, only drill 1/2 through (you don’t want to see any holes on the outer sides). 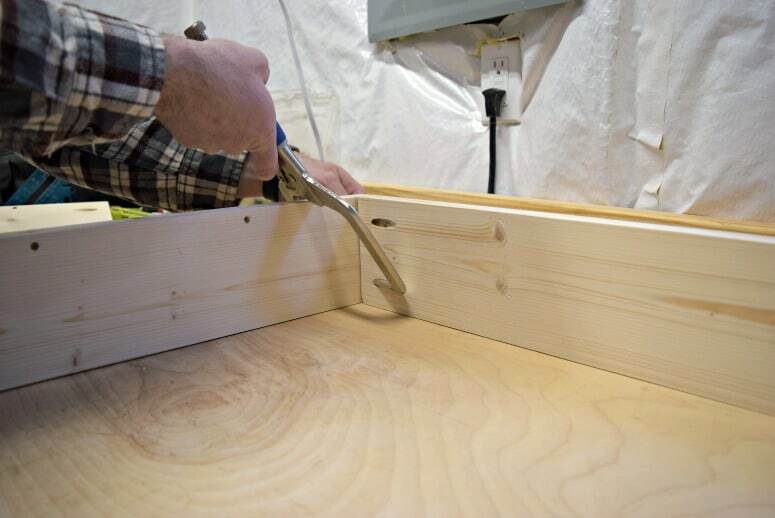 Once your boards are drilled, you’ll want to measure the keyhole hanger, about 3″ from the top of the board. Since the forstner bit is 5/8″, it’s important to very carefully drill into the wood, as it’s only about 3/4″ wide! 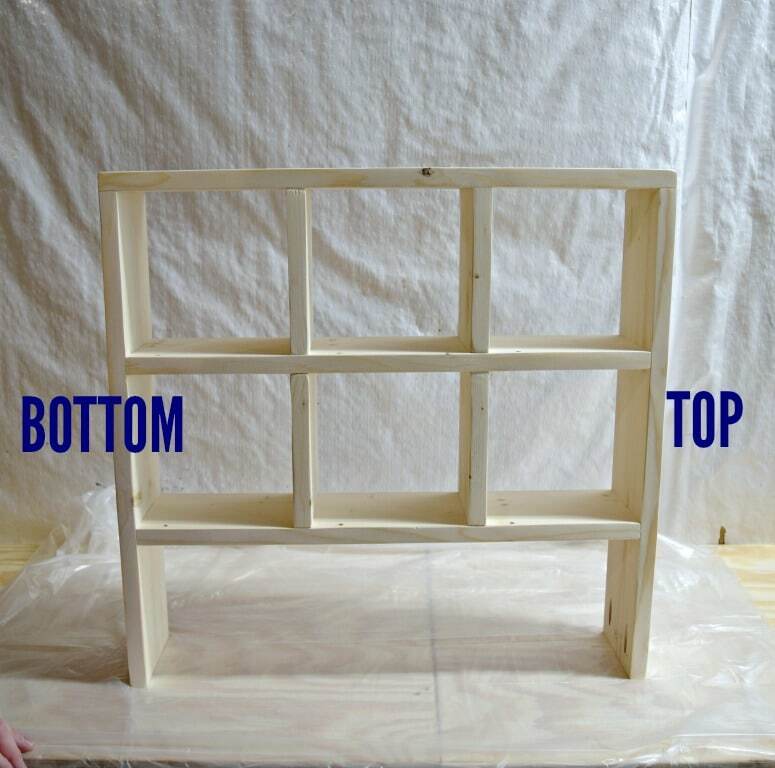 Use the bit to remove the wood from the top and bottom for the hanger. Use a small chisel to remove some wood in between. Optional: You can install your keyhole hangers now, or wait until you’re finished. Dry fit your boards to make sure they look straight! Next you will want to start joining your boards! To make it easier, use a right angle clamp. Your pocket holes should always be on the bottom of each level so that when you are looking at it (and empty of mugs), you don’t see any pocket holes. Always down. Jordan created these diagrams to help you fit the pieces together. You can see that it’s easier to assemble in inner sections once your outer box is joined. DO NOT Complete the assembly until you read the next step about installing the metal rod! To make it as easy as possible, fill in your Kreg plugs and sand them down prior to installing the metal rod. This leaves you with the most room to move around and sand the plugs. As you’ll piece it together, you’ll end up with one open side. This is where you’ll install the metal rod. 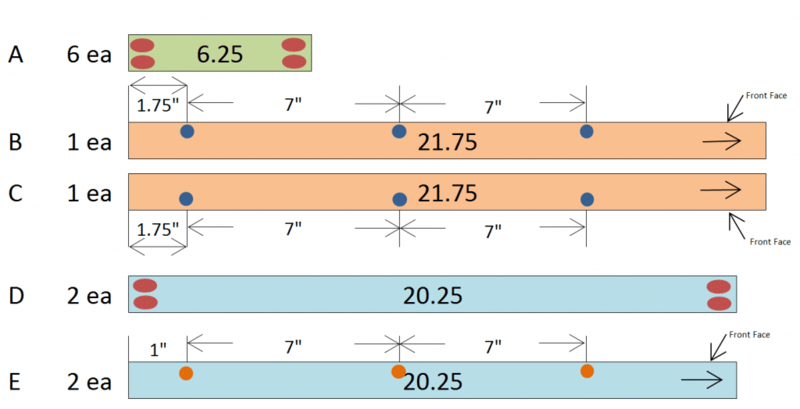 Cut the rod to 21″ for each level. Simply thread it through the holes and finish the assembly by joining the remaining exterior piece. Once your mug holder is assembled, lightly sand it down along the edges using an orbital sander. Then, stain it and apply a sealer. We always choose our go-to stain color and sheen. Lastly, drill in your keyhole hangers if you didn’t do it in the first few steps! And that’s it! It wasn’t nearly as complicated as reading this may appear. 🙂 Once you have your cuts completed and boards ripped to a smaller depth, it’s pretty easy after that. 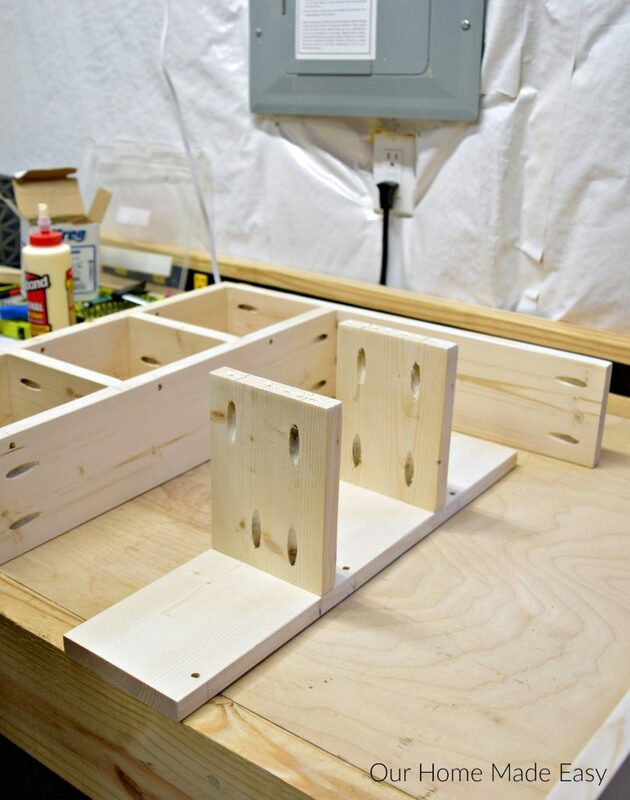 You’ll find that using the Kreg Jig really makes the project easy. 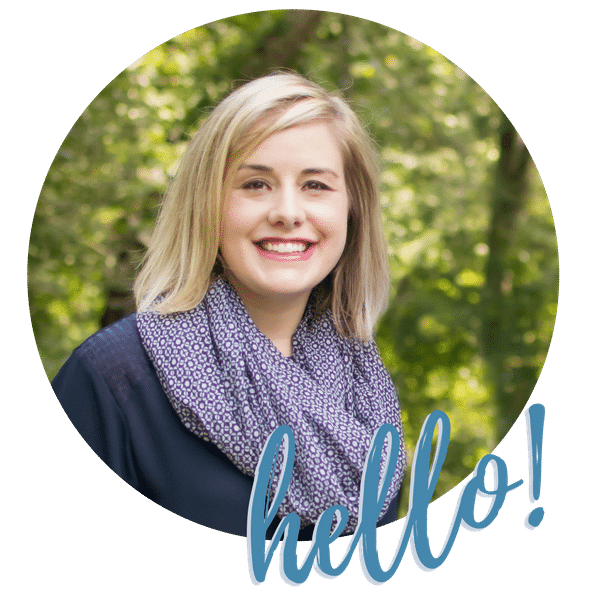 Are you a Rae Dunn collector, or do you know someone who needs this? Let me know in the comments! Whenever I make pocket holes, they come out much tougher than your holes. Yours looks clean and much more smooth. Is it my drill? My bit is pretty much new. I’ve had the device for a little more than a month and used it on two small projects. Any advice is greatly appreciated! Thank you! And I love this project! Thanks Katelin! Are you referring to the sides where it splinters a bit? We do a quick sand after making the pocket holes to make it all look a bit nicer. I asked the expert (my husband) and he thought speed [too fast vs too slow] or the type of wood could make a difference. It’s definitely not your new bit or the drill. I LOVE this idea!! It would look so amazing in my home. 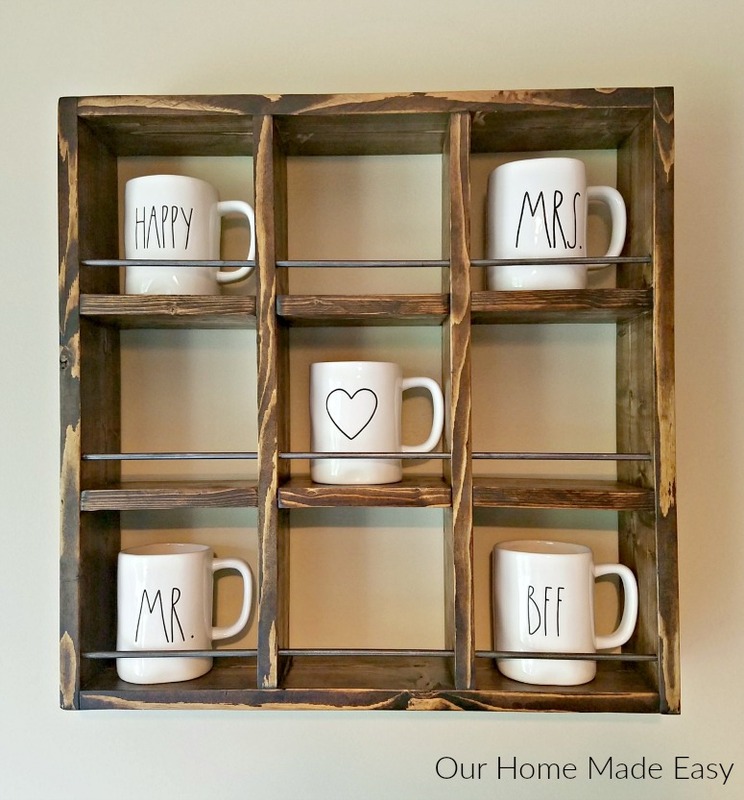 I wish I was crafty enough to make it or had all the necessary tools. Is there any way by chance that you all would make one for me?